What is the MaaserText service? MaaserText is a service of the Federation Beis Din that has been set up to deal with an increasing demand for assistance with separating Terumos and Maasros from produce grown in Eretz Yisroel. Many people are not educated in the practical observance of these mitzvos. Some people may initially choose to avoid purchasing these fruits and vegetables, in order to avoid the halachic issues involved, but once the produce is bought (and sometimes already cooked), they find themselves being required to separate the necessary tithes. MaaserText is on hand to provide practical and easy instructions to facilitate the correct tithing of produce from Eretz Yisroel. How does MaaserText help with the performance of this mitzvah? Simple and accurate instructions for the hafrosho – separation procedure. These instructions are available here, and we can forward them by email too. Prutah chamurah coin – the final stage of the procedure involves transferring the Maaser Sheni kedusha to a coin, and in some cases, a specially prepared prutah chamurah coin is required. Our service makes a prutah chamurah available for all. With a simple text sent to our system, members of the public are authorised to make one-off use of our coin. How do I take Terumos and Maasros? “I hereby designate the required Terumos and Maasros, according to the Federation Beis Din’s nusach, and I hereby redeem any Ma’aser Sheni and Revai onto the coin that has been set aside for this by the Federation Beis Din in accordance with Beis Din’s nusach, and the terms of usage of the coin. The entire process should be repeated for each individual species which requires hafrosho. I have already cooked Israeli produce into a dish with other food – what do I do? “The Terumos and Maasros I am separating should also cover the flavour absorbed in other foods and utensils”. If there is no Israeli produce left to take Maaser from, you must contact us for further instructions. Do I make a brocho before making the declaration? Produce grown in Eretz Yisroel may not be eaten until the required Terumos and Maasros have been separated. In rare situations, where one knows that the produce is tevel vadai – i.e. it has definitely not been tithed, a brocho is made before making the declaration. Israeli produce bought in the UK is considered to be of sofeik – doubtful – status, as there is a chance that these mitzvos have already been performed before the produce was exported. So although you need to perform the hafrosho ceremony, no brocho is made. Can someone else take Terumos and Maasros on my behalf? Yes. You may appoint an agent to take Terumos and Maasros on your behalf. Any Jewish adult is qualified to separate Terumos and Maasros. Remember – a hafrosho (tithing) performed by a child is invalid. Food remains forbidden – tevel – unless a Jewish adult tithes it correctly. I have asked my Rabbi to separate Terumos and Maasros for me. Can I bring some of the fruit round to him and ask him to separate Terumos and Maasros? The laws of Terumos and Maasros dictate that the food separated as the tithe must be in close proximity to the tevel fruit. If you bring only a portion of the fruit, the Terumos which you separate will only be able to cover the fruit you bring round. You should bring it all to your Rabbi. Alternatively, MaaserText can provide simple instructions so that you can perform this mitzvah yourself. Why is the Federation’s hafrosho declaration so short? Common custom is to use a shortened version of the hafrosho declaration. This is a practice which has its source in the instructions of the Chazon Ish and Minchas Yitzchok. Our formula verbalises the intent for all the tithes to be enacted in accordance with the carefully constructed text prepared by our Dayonim. 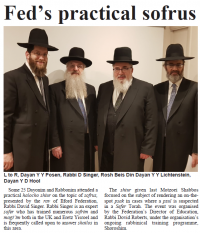 A hard copy of this text is held in the office of the Federation Beis Din and can be found on our website here. Some are particular to read the full formula, as this is a more ideal way to fulfil the mitzvah. You can find our Step by Step Guide to Separating Terumos and Maasros accompanied by a flowchart in our article entitled ‘The Ultimate Terumos and Maasros Guide’ here. When I learnt mishnayos, I understood that you need to separate and give away around 20% – why am I being instructed to separate only ‘a little more than 1%’? This issue is dealt with in full in the Hamaor article published at Rosh Hashanah 5777. I’ve heard something about a coin. Do I need to get a coin from somewhere? When using MaaserText, you do not need to own – or even see – the coin onto which the kedusha of Maaser Sheni is being redeemed. The work has been done for you, and the necessary coin has been prepared and resides in the offices of the Federation’s Beis Din. By texting MAASER to 07800 006 913, you receive permission to make one-off use of our coin. Why can’t I use my own coin? Using the Federation’s coin ensures that some complex halachic issues are dealt with. Simply put, if you are separating Terumos and Maasros from a small amount of produce (eg one carrot), the resultant Maaser Sheni will be of such insignificant value, that you will not be able to transfer its kedusha onto a coin which hasn’t already been used for Maaser Sheni. We have prepared a coin covering all bases which assures our users that whatever the case, they can always safely rely on it for redeeming their Maaser Sheni and Revai (fruit of the fourth year of a tree’s growth, that also requires having its kedusha redeemed onto a coin before consumption). What happens when I text MaaserText? You will receive an automated response directing you to a link where you will be given instructions (as above) on separating Terumos and Maasros – including the wording of the formula you need to say. Alternatively, you can receive them by email by emailing maasertext@federation.org.uk. Our system counts the number of uses of the coin, and when it fills, one of our Rabbonim ‘empties’ the coin by redeeming it on to one of lesser value. When the appropriate time for biur Maasros arrives, the coins will be destroyed and another one will be prepared. I haven’t received a confirmation text, can I still proceed? As long you have not heard from us you can’t make use of our coin. We have worked hard to avoid situations in which the coin is lost, unavailable or full. How many times can I use the Federation’s coin once I have texted and received confirmation? Does one need to separate Terumos and Maasros from Israeli produce which has been exported to Chutz La’Aretz? The ruling of the Federation Beis Din is that one should separate Terumos and Maasros. This psak is based on the opinion of the majority of early halachic commentators (Rishonim) Ra’avad, Bartenura, Ra”sh, Kol Bo (quoting Rabbenu Yonah end, of Perek VI of Brochos), Yereim (148), Sefer Hachinuch (284) and Rivma”tz, and is the view too of the Shulchan Aruch according to the consensus of the poskim. They all rule that one is required to tithe produce of Eretz Yisroel even once it has been exported to Chutz Laaretz. Are there opinions that do not require one to separate Terumos and Maasros outside Eretz Yisroel? The Rambam (Terumos, 1:22) and Shulchan Aruch (Y.D., 331:12) write that exported produce is not subject to the requirement to separate Terumos and Maasros; the Bach’s reading of the Rambam is consistent with this approach. However, most opinions interpret the Rambam (and the Shulchan Aruch) differently. Among others, the Mishneh Lemelech, Radvaz and Maaseh Rokeach explain that the Rambam and Shulchan Aruch are referring to cases in which the produce was taken out of Eretz Yisroel prior to Gmar Melochoh – the final stages of the harvesting. In this view, nowadays as virtually all produce that is exported has passed the stage of Gmar Melochoh, the Rambam and Shulchan Aruch would agree that Terumos and Maasros must be taken from Israeli produce. What are the opinions of contemporary poskim on this matter? 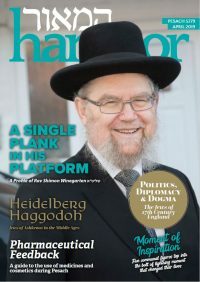 In terms of halachic instruction, there are clear indications in the writings of many Acharonim that one should tithe Israeli produce in Chutz La’Aretz. This would appear to be the opinion of R’ Akiva Eiger (Hagahos to Challoh, 2), as well as the Admas Kodesh (O.C., I:3) and the Gr”a (Yerushalmi, Maasros, 5:1) and is the psak halacha lema’aseh of the Sheilas Dovid, (Y.D., 18) and the Aruch Hashulchan (Aruch Hashulchan He’asid, Terumos, 57:3).With regard to contemporary poskim – the Chazon Ish (D’mai, 5:3,4), Mishnas R’ Aharon (I:40), R’ Moshe Feinstein (Igross Moshe, Y.D., III:127), Minchas Yitzchok (I:84), Chelkas Yaakov (II:78), R’ Shlomo Zalman Auerbach (Maadanei Eretz, Terumos, 1:22) and R’ Chaim Kanievsky (Derech Emunah, Terumos, 1:22:197) all pasken that Terumos and Maasros must be separated. Imrei Binah (end of I:11) testifies that this was also the commonly accepted practice. Locally, Rav Chanoch Padwa Zt”l (Cheshev Ha’ephod, II:18) also paskens that one should separate terumos and maasros, and notes that this is the prevalent custom in London. Why have I not heard before of people separating Terumos and Maasros in the UK? In the past, Israeli produce (other than Jaffa oranges) were not commonly found in UK stores. (Wines and manufactured and canned goods from Israel invariably bear a hechsher, and thus have had Terumos and Maasros separated at source). Nowadays though, depending on the season, it is much more common to find fresh Israeli fruit and vegetables in UK supermarkets; these are almost inevitably tevel. (Some, but not all, of the Jewish-owned supermarkets have rabbinic supervision that ensures that all Israeli produce has been tithed before going on sale). As noted there is a minority opinion which is lenient on this matter and does not require one to separate Terumos and Maasros from Israeli produce in Chutz La’aretz. Some Rabbonim may rely on this source. However, the majority opinion and the established historical norm in many Diaspora communities is that one should take Terumos and Maasros. It should be noted that many of those who rule leniently base their decision on the assumption that there is a possibility that the produce was tithed before export. Experts in the field have told us that in today’s market this is almost always not the case. MaaserText was set up to raise public awareness of this important issue, and to provide simple instructions and all the necessary requirements at the touch of a button, so that this important mitzvah can be kept without any difficulty. By separating Terumos and Maasros, you will be able to buy Israeli produce with confidence, support the Yishuv and enjoy a new-found connection with Eretz Yisroel, its kedushah and its special mitzvos. How do I take Maaser from peppers of three different colours? Regarding different coloured peppers these are our specific instructions. 1. Text MAASER to 07800 006 913 to receive permission for one use of our coin. 2. Separate a little more than one percent from EACH colour pepper . 3. Make the hafrasha declaration to cover all three pieces. “I hereby designate the required Terumos and Maasros, FROM EACH TYPE FOR ITS TYPE according to the Federation Beis Din’s nusach, and I hereby redeem ALL Maaser Sheni and Revai onto the coin that has been set aside for this by the Federation Beis Din in accordance with the Beis Din’s nusach, and the terms of usage of the coin.” 4. Wrap up the three pieces of pepper which have been designated as Terumos and discard them in the bin. The rest may now be eaten. If I have question who do I contact? As always, questions on practical halocho can be sent to our team of Rabbonim through ShailaText – text your shaila to 07403 939 613. MaaserText is a spin-off project resultant from popular ShailaText questions and operates in conjunction with Keren Hamaasros of England. Keep on asking!